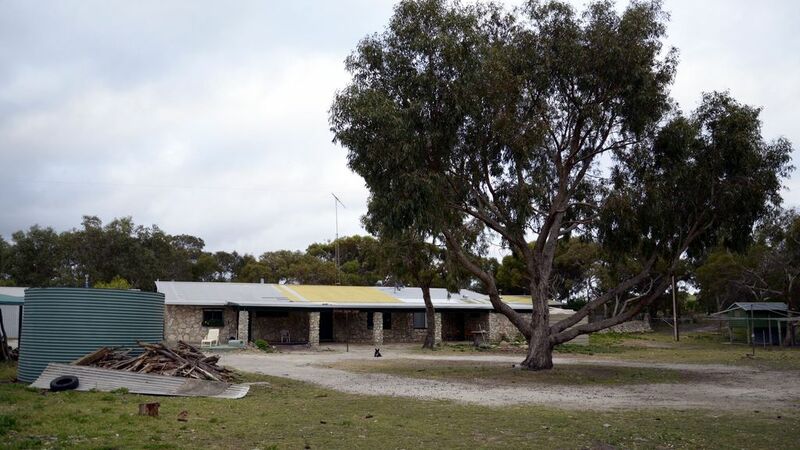 Pelican Lagoon Lodge is the best value fully serviced large holiday house on Kangaroo Island. This is a VERY big house. Located on the main sealed Hog Bay Road, just 18 km from the Penneshaw Ferry terminal, and 30 km from the Kingscote airport. Set on 60 acres of bushland on the shores of Pelican Lagoon, this rustic rural retreat offers comfortable beds and personal service. Book the entire lodge for exclusive use for a group holiday from 6 to 16 people. Five bedrooms, three bathrooms, two kitchens, very large lounge and dining room, outside BBQ area, safe and secure parking, free wifi internet, satellite foxtel 51inch/130cm large TV. Kitchens are complete with everything needed for self catering, including appliances such as electric stove, microwaves, convection oven, rice cookers, woks, bread makers, food processors etc.. Plus a dishwasher. Children and family groups welcome. Safe fenced areas for children to play. Some pets welcome upon negotiation. There are farm yard animals in the pens and paddocks and more Kangaroos outside the fenced areas than anywhere else on Kangaroo Island. A portable cot and child's rollaway bed available - no charge for infants and children under two years of age. All fine quality pure cotton bedding and towels supplied. Your host lives on site and is able to assist when required, in any way needed to help make your Kangaroo Island holiday an enjoyable vacation. Come and stay at this amazing location in this unique stone building and see the real KI. Let us look after you to ensure you get the very best out of your Kangaroo Island holiday. Please contact us today with your inquiry to discuss your holiday requirements. Excellent place to stay with a group of people with great facilities and services. We had an amazing experience staying at this property with a group of families. We had rented the full house and the facilities were just superb. Our host Lisa is not just a great host but a very good person and very helpful too. She even helped one of our group members by providing first aid. She even suggested some nice places to visit and provided helpful tips for care to be taken while travelling to Kangaroo island. Kids enjoyed alot playing with the piano and with the farm animals, especially feeding the goats. The stay was very relaxing. I would highly recommend anyone to stay here if they are planning to travel to Kangaroo island. Again I wish to thank Lisa for everything.